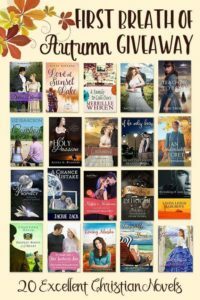 Fabulous Fall Christian Paperback Giveaway! First Breath of Autumn Christian paperback giveaway! Celebrate the beginning of fall with our wonderful giveaway! Enter using the Rafflecopter below between September 24 and October 14 for your chance to win all twenty Christian fiction paperbacks shown, plus some fun swag. No purchase or newsletter sign-up required. Sorry, prize can be delivered to a US postal address only.